On the arrival at Indira Gandhi International Airport, New Delhi you will be welcomed by our tour representative and transfer to the hotel. Check-in to the hotel and relax. According to your convenience you can spend the evening in your luxury room or travel in and around the local venues for hangout. After breakfast, get ready for Delhi sightseeing. On the second day of your holiday, you will be delighted by the uniqueness and richness of the metropolitan city. In ancient times, the city of Delhi is known as Shahajahanabad. Your city will start from Red Fort which is one of the most common historical monuments in the region and it was built by Shah Jahan. Next, you will visit Raj Ghat and the lush green complex will grab your attention. Later you will have memorable moment in the crowded Chandni Chowk. Travel in and around the narrow streets of the bazaars through rickshaw. All these sites are located in Old Delhi. In the Red Fort you will also enjoy Light and Sound Show that signifies the golden erstwhile era. After breakfast, check-out from the hotel and ready for drove towards Nainital. On the arrival at Nainital, check-in to the hotel and relax for couples of hour. 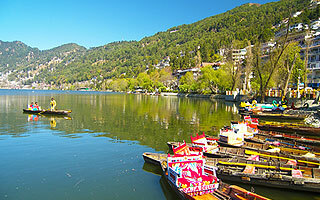 Nainital is a summer resort located in the state of Uttaranchal. In the hill station, there are numerous sky-touching peaks that are blessed with rare features of Mother Nature. From such high peaks you can enjoy picturesque view of surrounding. After breakfast, get ready for Nainital sightseeing. Every nook and corner of the hill station will magnetize your attention. Places of tourist interest in the region that will magnetize your attention are Naini Lake and here there is also a religious Maa Naina Devi Temple which is one of the sacred places of worship for Hindus. In the lake you will also enjoy entertaining boat ride. After visit to the temple and lake, you will enjoy trekking to reach Snow View Point which is one of the highest peaks. 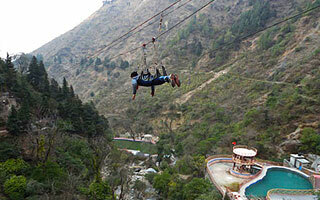 In the evening, you will take to visit Nainital High Altitude Zoo which is home to varieties of flora and fauna. Species you will observe here are Rose ringed Parakeet, Himalayan Black Bear, Sambhar Deer, Palm Civet Cat, Silver Pheasants and other lovely Himalayan birds. After breakfast, get ready for an excursion to Ranikhet. Ranikhet is a beautiful town. Interesting sites you will visit in the picturesque town are Kumaon Regimental Museum, Kalika Mata Temple, Golf Ground, Dwarahat, Mount Trishul, Bhimtal and Naukuchiatal. After breakfast, get ready for an excursion to Corbett. On the arrival at Corbett, check-in to the hotel and relax. 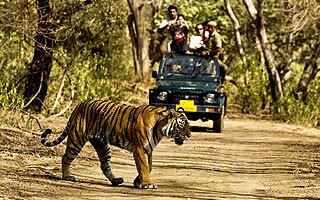 Jim Corbett National Park is one of the most thrilling wildlife habitats to enjoy wildlife tour. The total area covered by the wildlife habitat is around 500 square kilometres. The dense forest is reserved for Project Tiger and spread over the lush green Himalayan Ranges. Here you will discover and explore varieties of exotic flora and fauna. The wildlife centre is popular all around the year because of its large population of Leopards. It was founded in the year 1936 and initially called as the Halley National Park. Discover every site of the dense jungle through Jeep Safari. Early morning get ready to explore Corbett. Your visit to the national park will be delighted by the wild activities of species and lush green beauty. As soon as you enter the gate of Corbett, you will sit on the back of Elephant and ready for the Safari inside the park. Wild species you will observe are Tiger, Flying Fox, Sambar, King Cobra, Elephant, Wild Boar, Chital, Nilgai, Hedgehog, Gharial, Muntjac, Common Musk Shrew and Indian Pangolin. You will also witness more than 600 lovely species of birds. After breakfast, check-out from the hotel and get ready to drive towards Mussorie. On the arrival at Mussorie, check-in to the hotel and relax. Mussorie is the most beautiful hill station where you can discover the hidden beauty of Mother Nature. After breakfast, get ready for Mussorie sightseeing. After breakfast, check-out from the hotel and get ready to drive towards Haridwar. Haridwar is one of the religious sites in India and overflow with thousands of devotees and common vacationers every day. The destination is 'The gateway to the Gods'. Experience and explore the religious and spiritual values of the site. On the arrival at Haridwar, check-in to the hotel and get fresh. After relax, you will visit the places that are worth for your holiday. Places are Mercury Shiva Lingam Temple, Gorakhnath Temple, Daksh Mahadev temple and Mansa Devi Temple. All these temples are religious places of worship for Hindu devotees. After breakfast, you will go an excursion to Rishikesh. Rishikesh is conted among the sacred worship place for Hindus. In and around the destination there are many temples and ashrams that highly signify the religious and spiritual features of the town. Temples located in the town are devoted to Hindus Gods and Goddesses. Shatrughan Temple, Raghunath Temple, Laxman Jhoola and Rishikund are religious sites you will visit and offer prayers for blissful life. After breakfast, check-out from the hotel and get ready to drive towards Delhi. On the arrival at Delhi, you will be welcomed again by our tour representative and transfer to Airport for further journey. Tour ends. Return back to home with great memories. Any portage at Railway Station and hotels, tips, insurance, mineral water, telephone charges, and all items of personal nature.